Finally available for sale at the Seder-Masochism Merchandise Empire. Welcome to my new Stitching Blog. 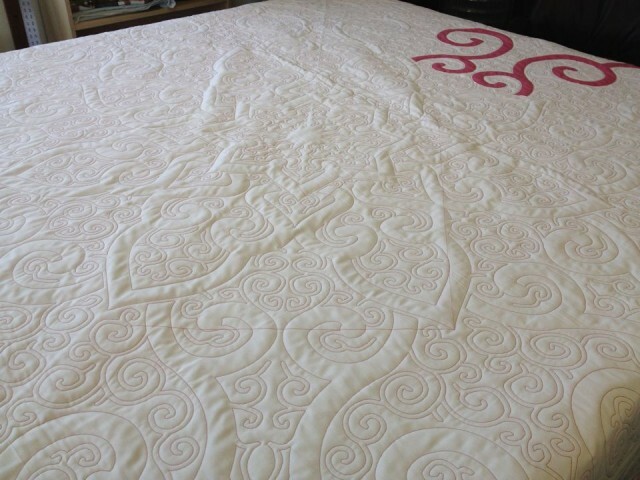 It’s like my regular blog except all about quilting and embroidery. I’ve separated the two, because I get the feeling that people interesting in my science writing and app-making activities may find all the stitching a bit tedious, and vise-versa. 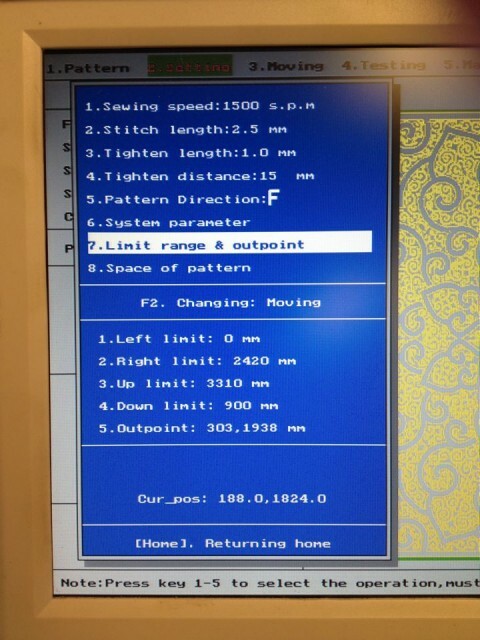 Also, I have taken the liberty of using the same list of subscribers to my stitchcam as the list to be notified (via rss feed) when there’s a new post on this blog. 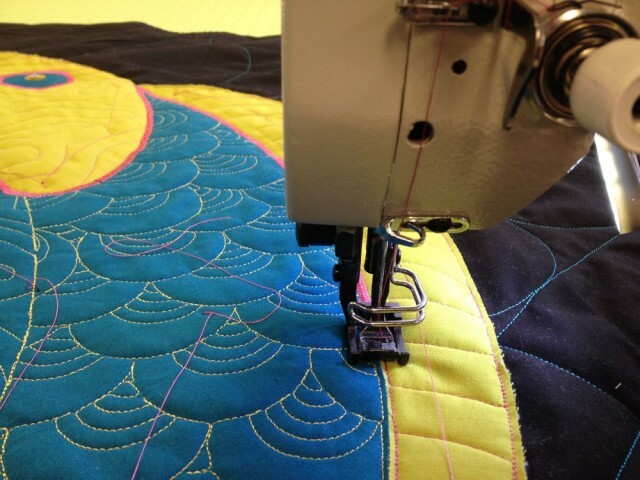 I figure if you’re interested enough in stitching to get real-time notifications of a quilting machine running, you’re probably interested enough to hear about an occasional blog post. 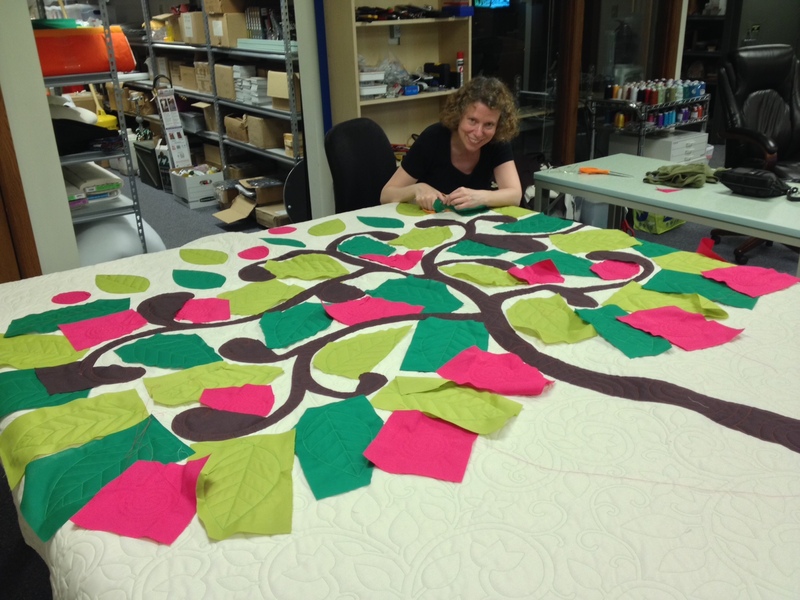 So without further ado, my first new stitching-related blog post. I’m afraid it’s a rather technical one…. One of the big problems with fabrics and quilting is that fabric is not a proper engineering material. It’s stretchy and sloppy and never goes exactly where you want it to. The situation only gets worse when you add batting to the equation. 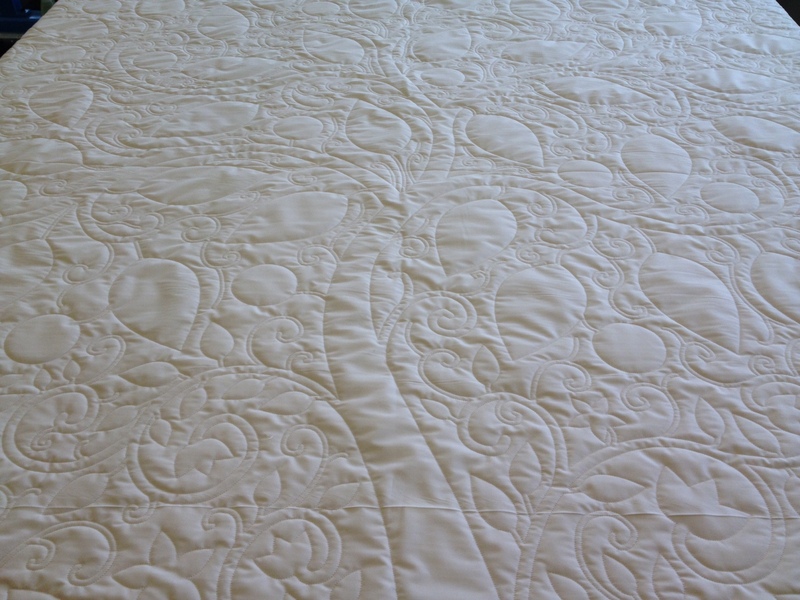 We’ve been experimenting with extra-thick batting, as much as two inches thick, and have had a problem with the resulting “quilts” not lying flat, because some parts of the pattern shrink the dimensions of the fabric more than other parts, resulting in a sheet that is internally stressed. You might think it’s a simple case of more stitches equals more shrinkage (as it more or less is with embroidery), but this is not the case. 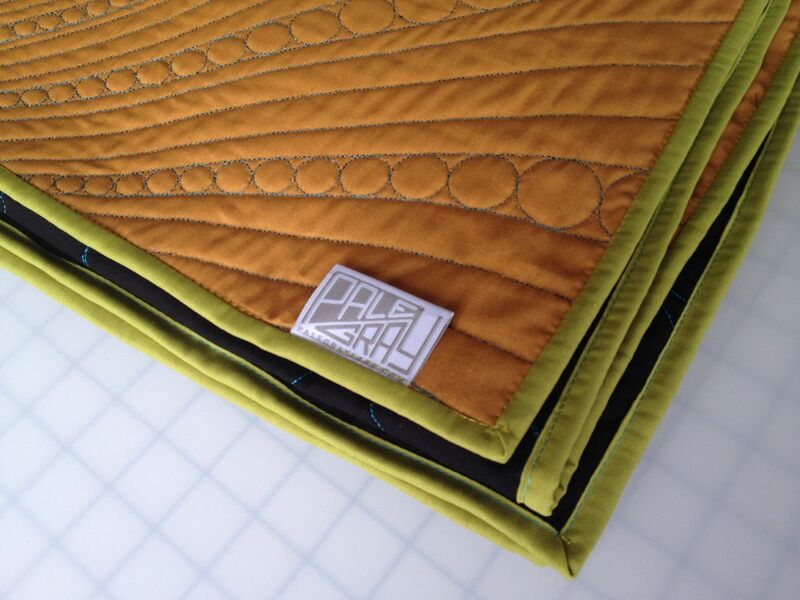 To see why, consider a cross section of a quilt with different spacings between the quilting lines. 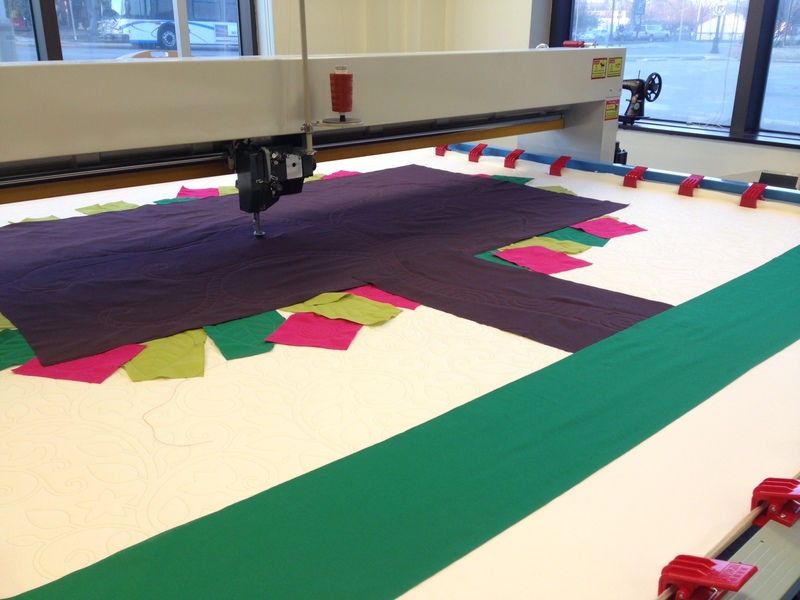 When there are no lines, the fabric on the top and bottom are flat, and the piece overall will be just as long as the fabric originally was. 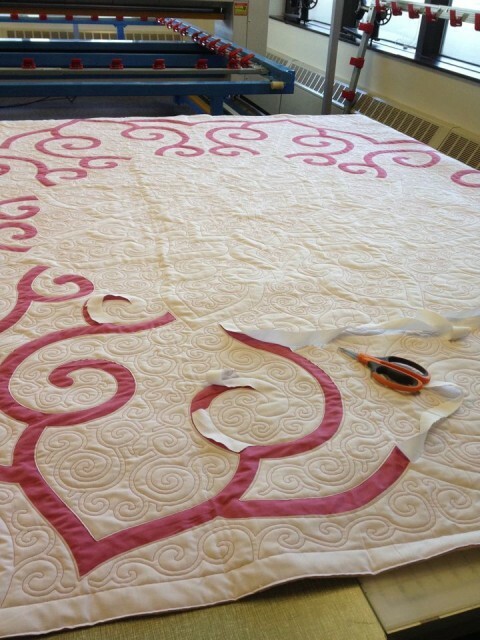 As you add more lines, the fabric is forced to go up and down, so even if the fabric isn’t physically compressed, the piece overall will get shorter. Here is a schematic illustrating this fairly obvious fact. 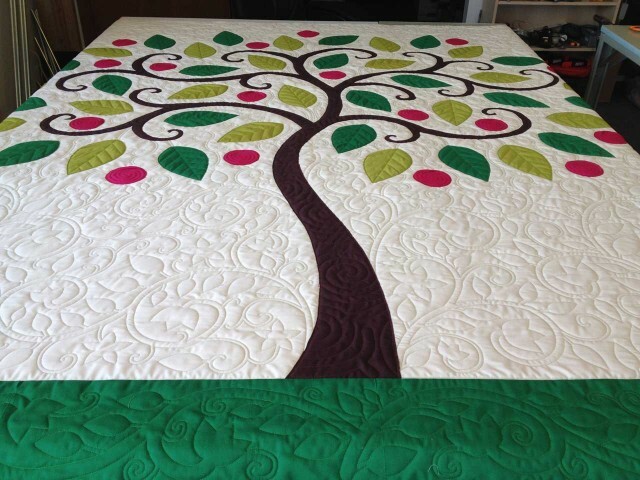 Clearly if the lines (the top and bottom fabric) stay the same length, the overall length of the quilt must get shorter. As you can see, there is a minimum length around 30 humps, and by the time you get to 200 humps (0.5cm line spacing) the thing is well on its way back to its original length. The interesting fact about this is that, because there’s a minimum, there are going to be two ways to get any given amount of shrinkage, a large-spacing way and a small-spacing way, one on either side of the valley. 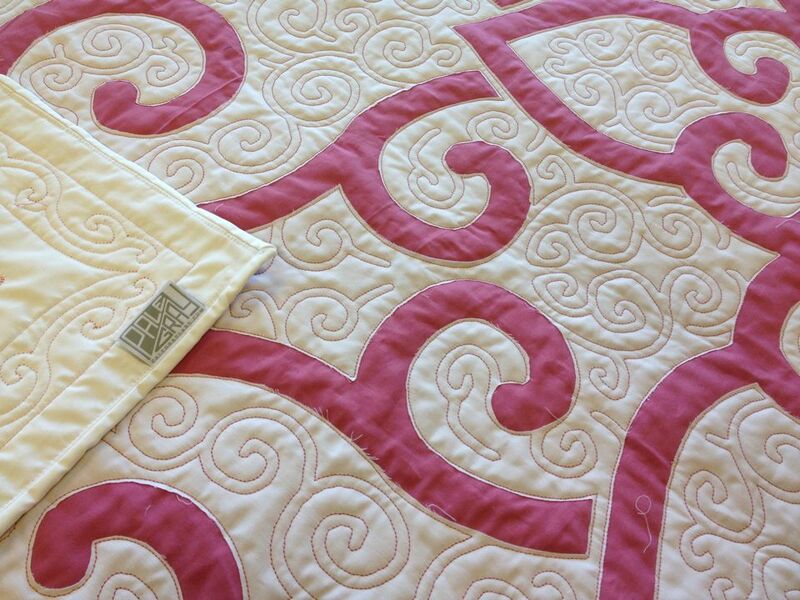 In order to get a quilt that lays flat, you don’t have to keep all the spacings the same, you can have zones of stitching width spacings on either side of the minimum. The following graph is a bit harder to read. The horizontal axis represents the line spacing in the direction of shrinkage (just like in the graph above). The vertical scale is again overall length of the piece. 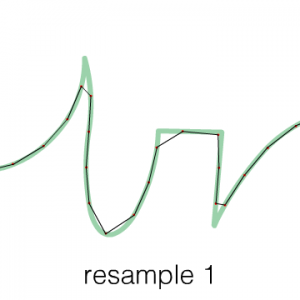 The lines connecting data points represent sets of similar spacing in the lines going the other direction. The bottom set has no cross-lines (i.e. it’s the same data points as the graph above, except a smaller number of them shown). As you go up, each line represents more and more closely spaced cross-lines. The data points are labeled with the line spacing in the shrinkage and crossed directions respectively. The result is as expected: The more closely spaced the crossed lines are, the less shrinkage there is, regardless of how closely spaced the lines are in the shrinkage direction. Now all we need to do is actually use this information to make something pretty that doesn’t warp…. In the mean time, we’ve been experimenting with the other solution: Stretching on a frame. Was all the quantitative measuring useful? Maybe…. 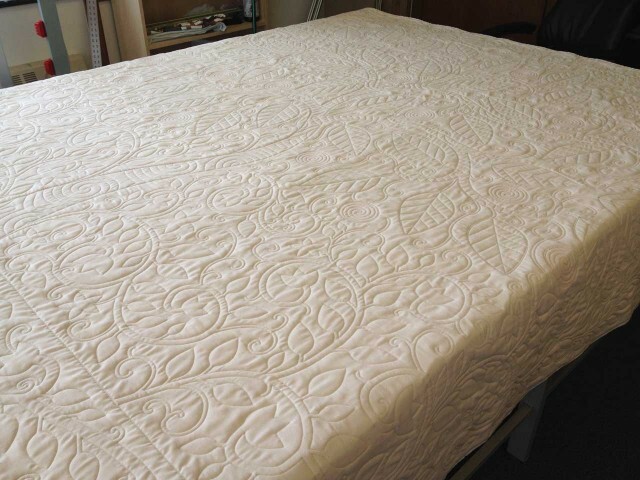 So far I’ve used it only to create an interpolating function that I have used in some calculations involving how wide to make flaps that wrap around the wooden frame holding up stretched quilts like this. Hm, that’s probably another blog post too. I could do this much more efficiently now, using what I’ve learned since then. Which is good, because the better I get at this, the more I can help someone else create algorithms to automate this kind of work. 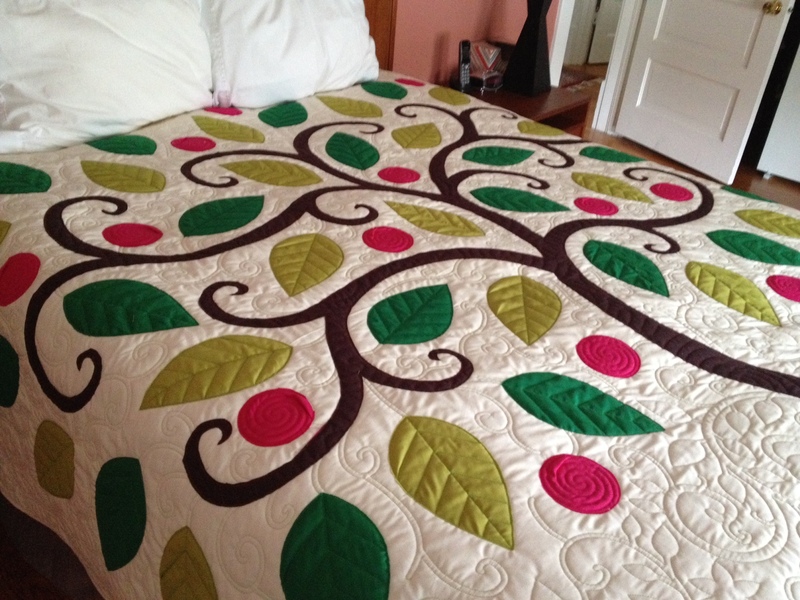 And yes, at some point we hope to offer an affordable $100 Quilt. But first I have to get the design right, and then our potential partner has to be able actually produce it without losing money. We’re working on it. Our quilted money is one of the few things I don’t share source (in this case, vector) files for, because currency isn’t exactly like other culture, as I explain here. Single-line art is the holy grail of quilting design: the sewing machine head can stitch the entire design without starting, stopping, or breaking thread. 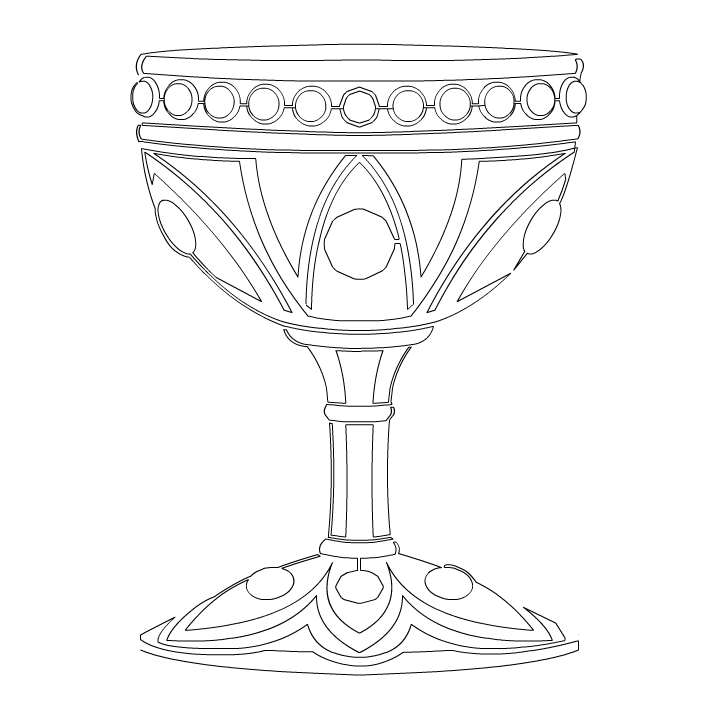 To illustrate this for an upcoming talk I drew a holy grail as a single-line drawing. I did this by hand in Flash, and made this simulation of a simulator by deleting line segments one at a time. I would love a program that intelligently automatically converts my line art into single-line art. Theo made something like that already, which preserves all the line segments and relies on back-tracking. But I’d also like something that replicates what I did here by hand: removing and adding small line segments so no back-tracking is needed. It would need to analyze which smaller line segments could be sacrificed, and which segments could be doubled (parallel lines can be easily added to a design like this). 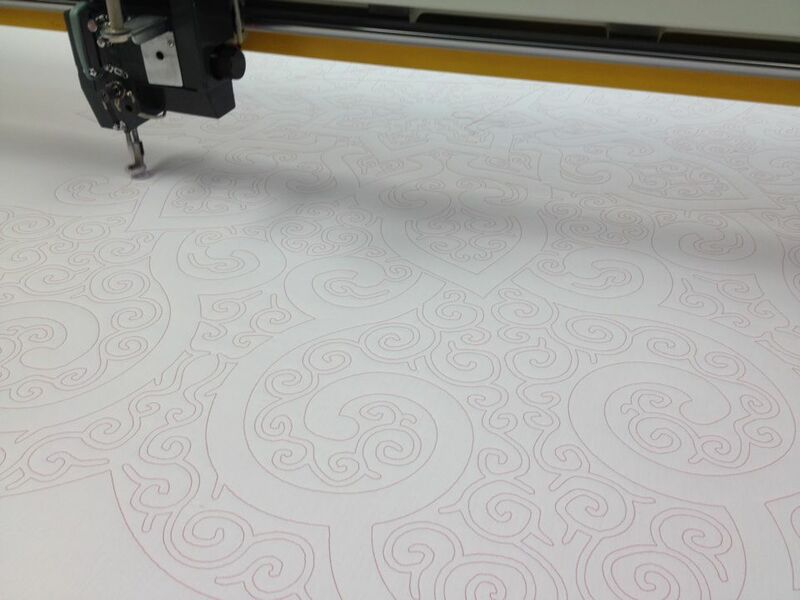 You need single line art for automated quilting, and that’s what we do. But getting from regular line art to single-line art is currently no small task, for humans or computers. 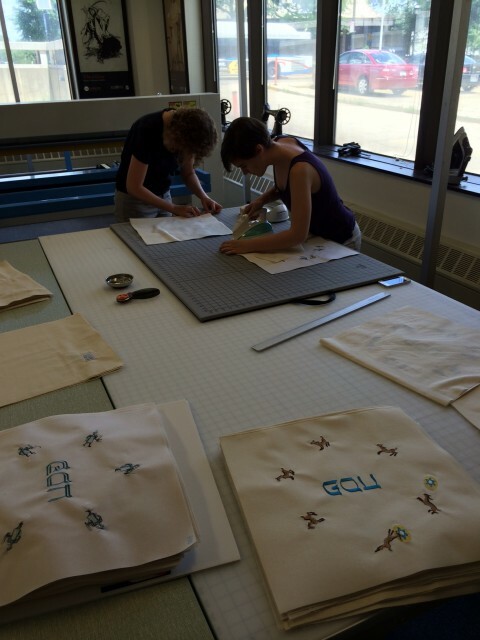 We have a lot of additional photography, stitchcoding and stitching to do, but we are making progress. 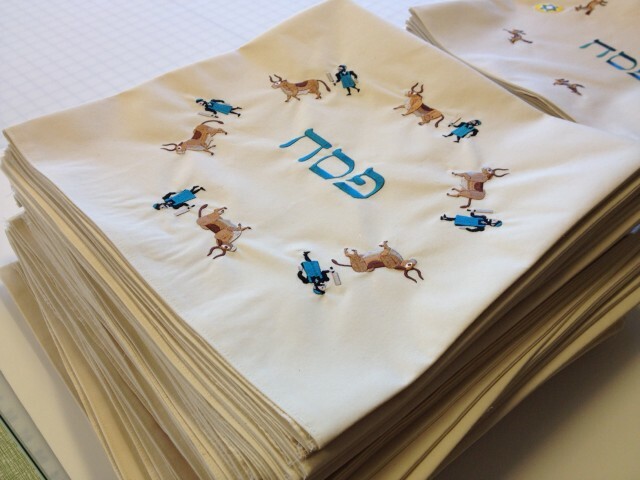 When the film is done the matzo covers will be for sale. 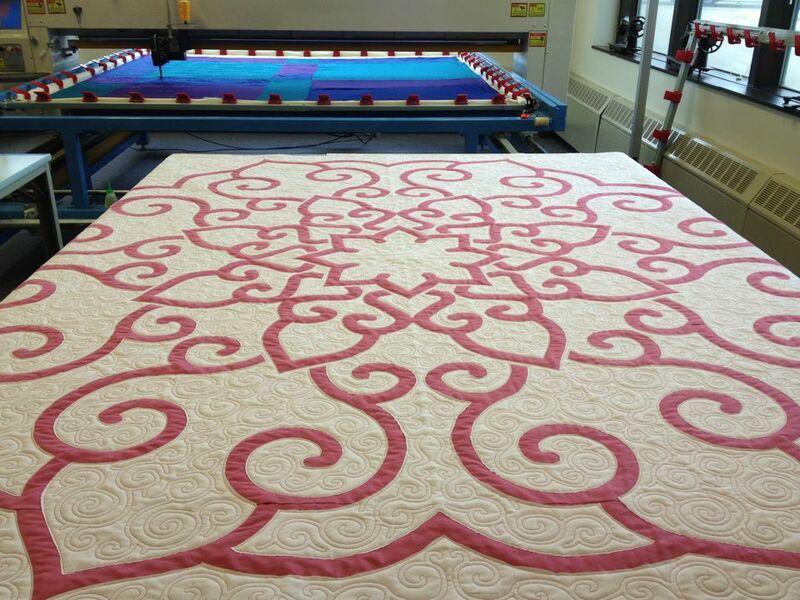 Our Thousand Dollar Quilts now have a web site of their own. Offered at face value. Interestingly, money is not culture; currency is. More on that in my essay Culture is Anti-Rivalrous (scroll down to part IV). 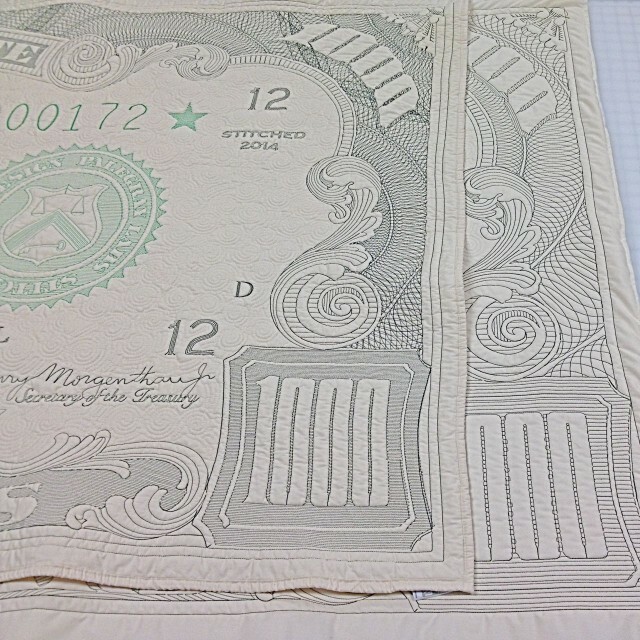 And here I am, a Free Culture advocate minting money on my quilt plotter. My impulse to share source files is mitigated by this. Free Culture readers of this blog: how can I best share the culture of this project without compromising the identity of the bills themselves? I like to share the “source code” of my projects once they’re out there, but I don’t see how I can do that with this one. 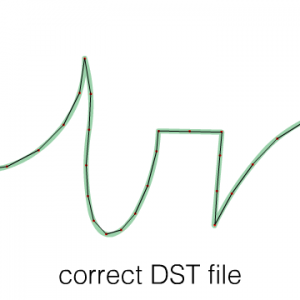 Our Quilt Plotter’s rather frustrating software automatically resamples DST files, for no explicable reason. 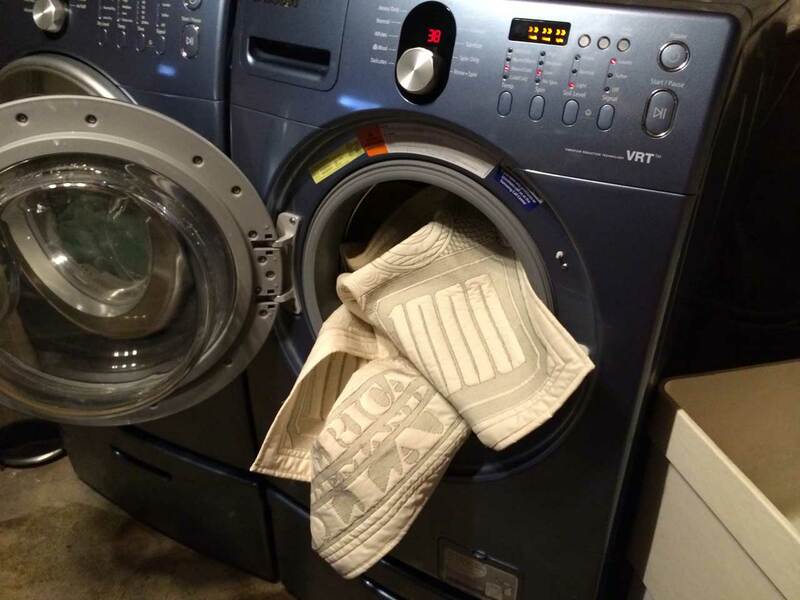 While we struggle to communicate with its manufacturers to overcome this “feature,” I attempted to explain the problem in pictures. 2. This has a high sample rate, because there are many points spaced close together. 4. Every time the path is resampled, it moves further from the original line. This happens even if it’s resampled at the same sample rate, as shown here. 5. Same sample rate, worse fidelity because of resampling. 6. If we resample enough times, eventually our path won’t resemble the original line. 7. Not what we want. THIS is what we want the machine to read. We can control all the points in the DST file in Mathematica. We just want the machine to not resample them, to keep the points in the original file we give it. 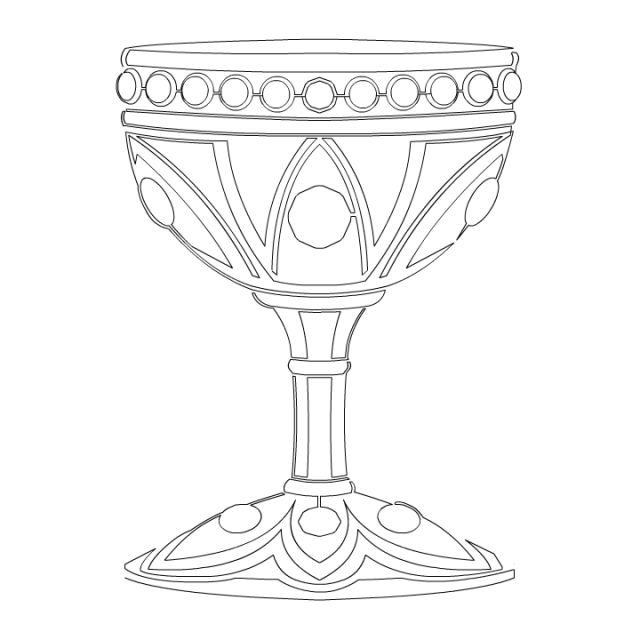 Here the points are evenly spaced except at corners and curves to preserve fidelity. 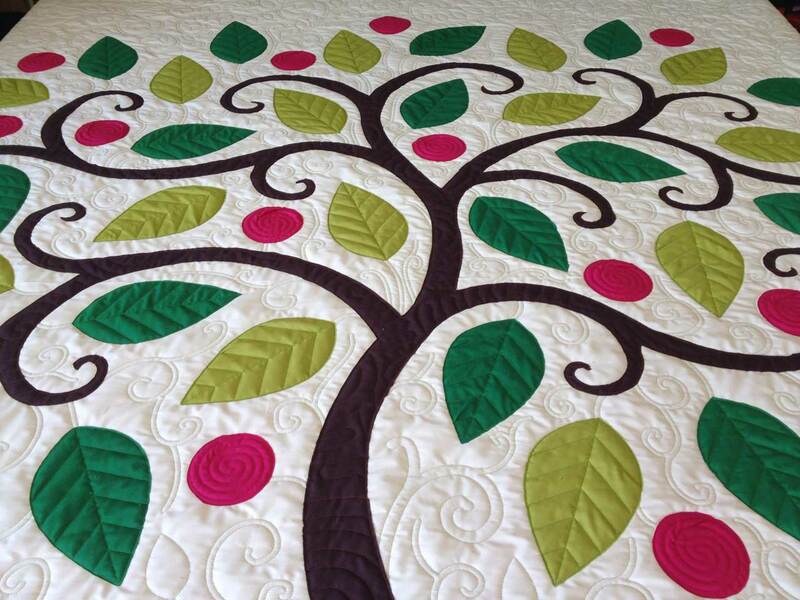 Stitch all-over background design, including shapes where leaves, fruits and branches go. 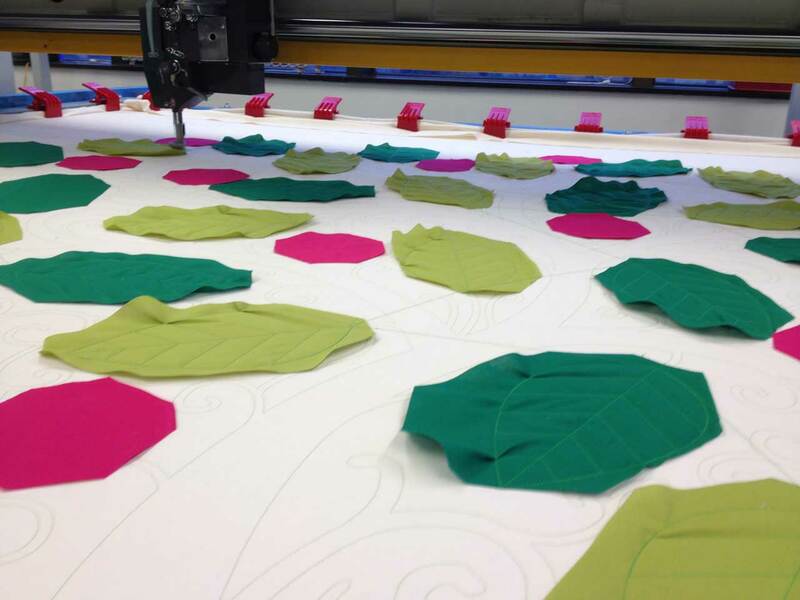 Cut out pieces of leaf- and fruit-colored fabric. Lay them on the quilt (still in the frame) over where they’ll be stitched down. Return frame to quilt plotter and stitch. When the leaves and fruits are stitched, lay a big piece of brown, tree-colored fabric over them where the branches go, and another piece where the trunk goes. Stitch. 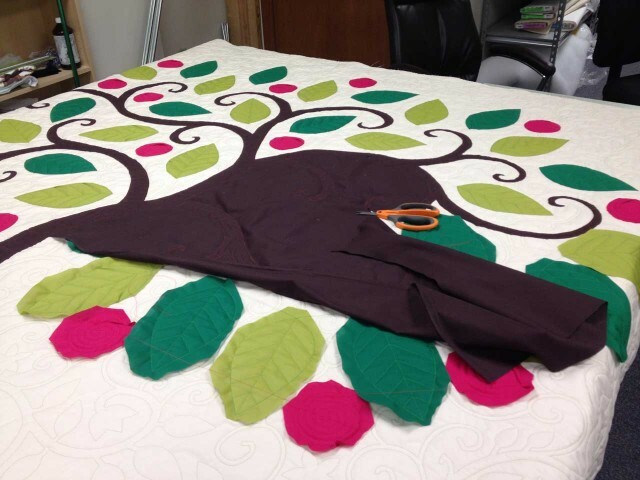 Trim the base of the tree and lay a piece of green fabric over it as above. Stitch that sucker down per the digital design you’ve carefully prepared. 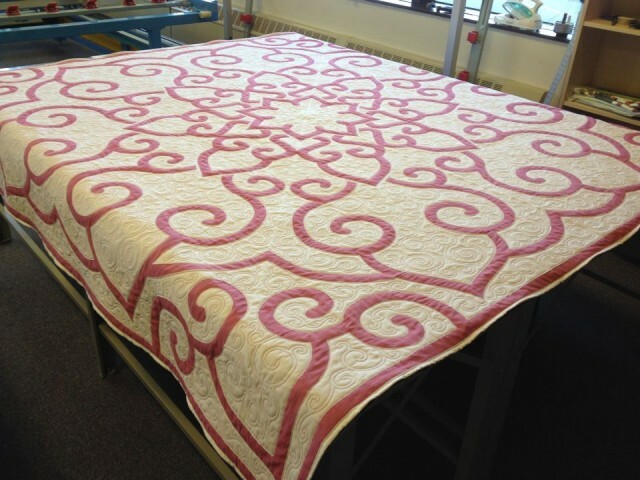 Then fold the fabric over and quilt on the top. When done stitching, remove quilt from frame and trim. Begin snipping. 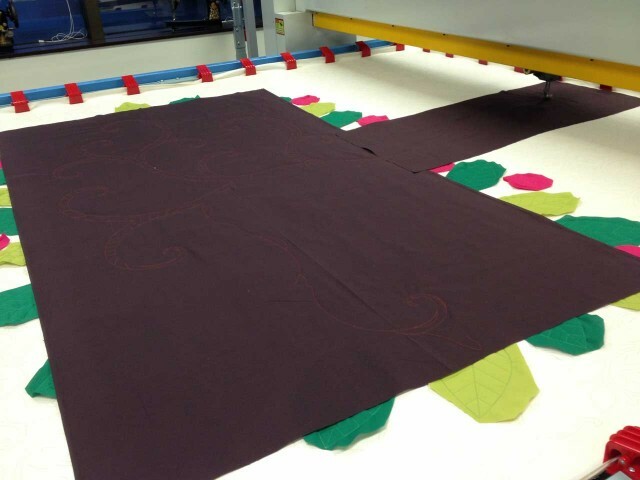 Snip until done, then bind. Back on the Quiltimation front, I was wondering if I could arrange animated frames on a quilt in a mandala/medallion pattern, rather than left-to-right cells. This would essentially be a quilted phenakistoscope, with the animation emerging as the whole thing is rotated (we’d keep the camera and lights stable, and rotate the quilt). 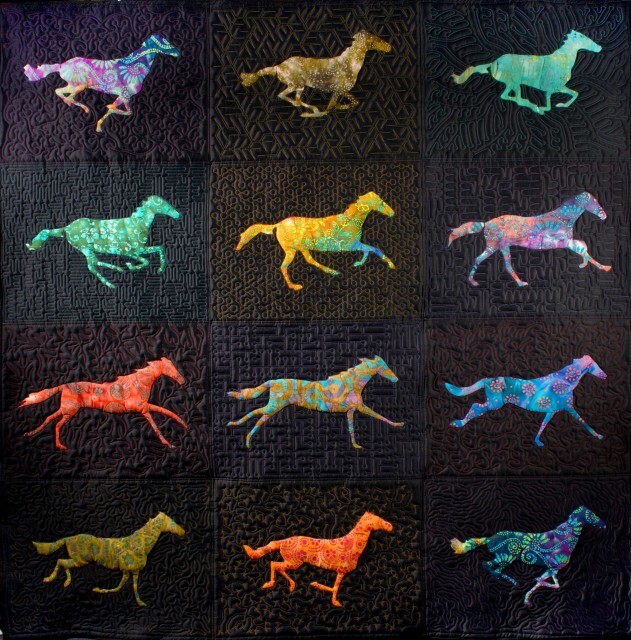 The saturated colors here would be lost, although I could use a few colors of thread. The elements are early Leviathan designs, and Water from Chad Gadya which is still in (very slow) progress. 1. 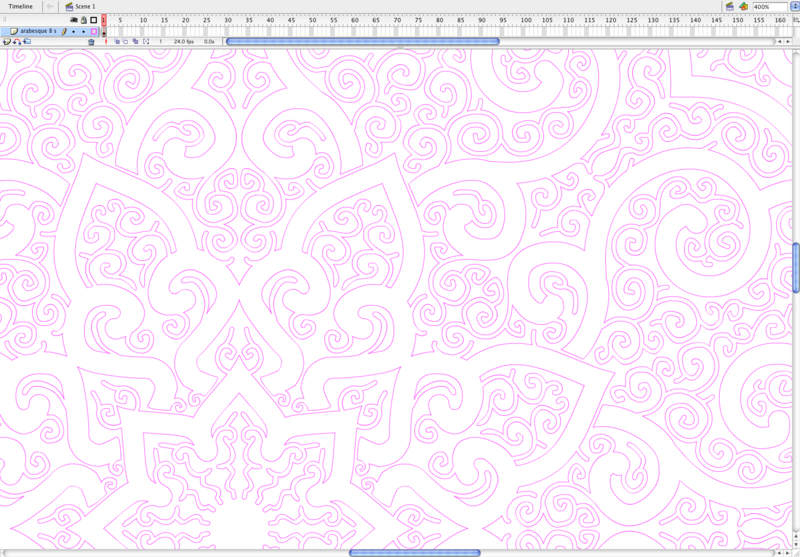 Draw vector design in Macromedia Flash 8. 2. Load onto Quilt Plotter and set appropriately. 7. Bind on Davis Vertical Feed treadle (best binding machine ever). 9. Place on Momz’s bed. 10. Get approval from cat. This is an experiment/prototype. Someday we may sell these, but for now PaleGray Labs is just research & development, consulting, and commissions. Anyone want to buy my almost-new 16″ quilting machine? 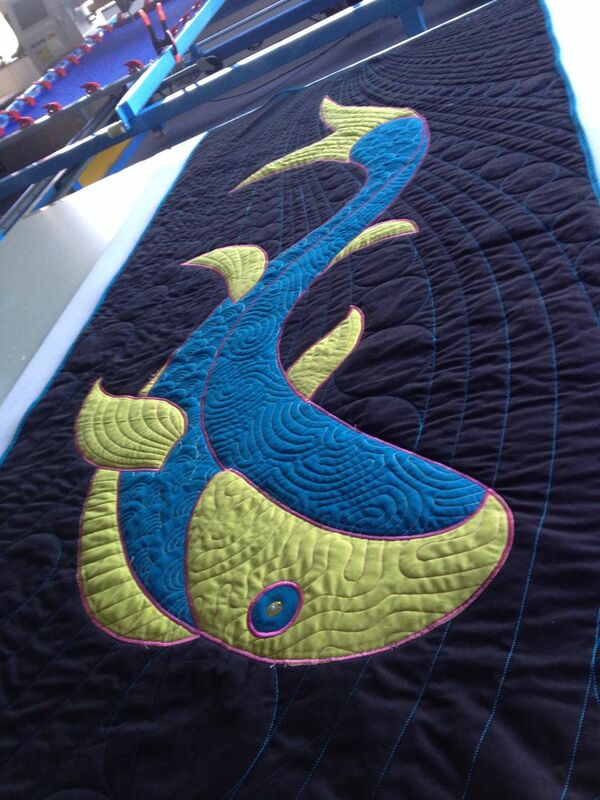 Handi Quilter Sweet Sixteen (I didn’t name it! 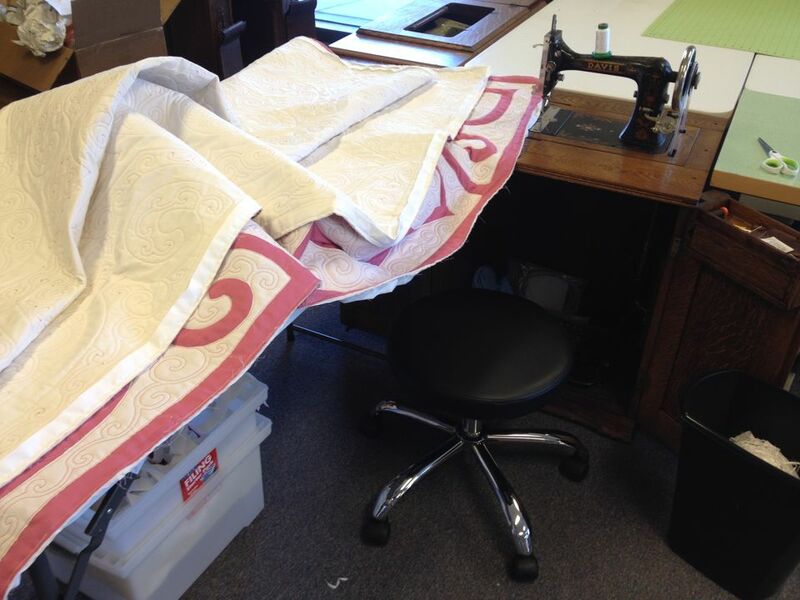 I’d paint over the name but it would reduce resale value) sit-down long arm quilting machine. Less than one year old, only 134,228 stitches total. 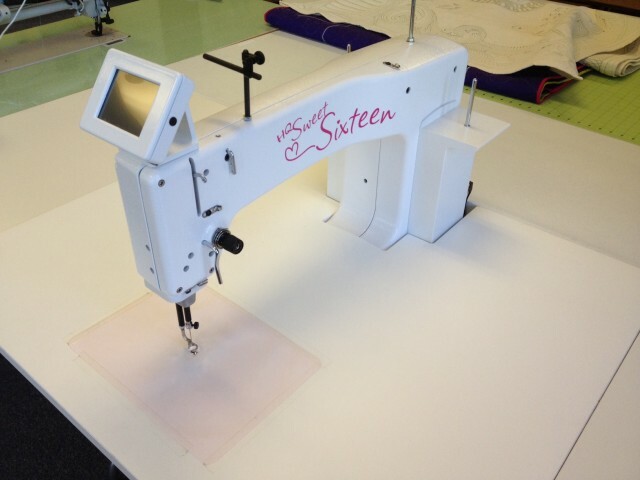 Includes table, two table extensions, smooth table overlay, open-toe hopping foot (in addition to closed-toe foot it came with), extra needles, bobbins, tools, supplies, manual, documentation, etc. Selling because I bought a full-frame computer-guided system, and now do any hand-guided work on treadles. It’s a great machine, practically brand new, and just gathering dust in my studio. Pickup only in downtown Urbana IL. I’m happy to give instruction and let you “test drive” it before buying. 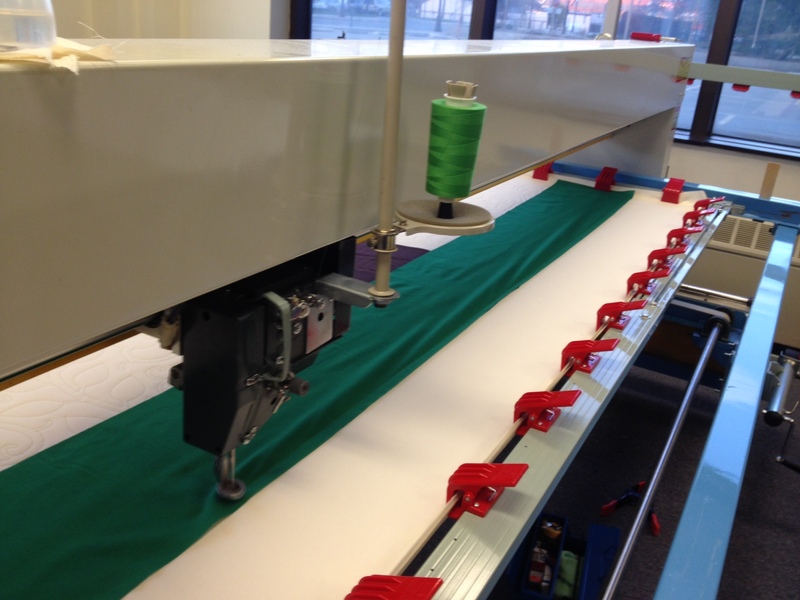 Selling for $4,500 without the separate bobbin winder, or $4,800 with. 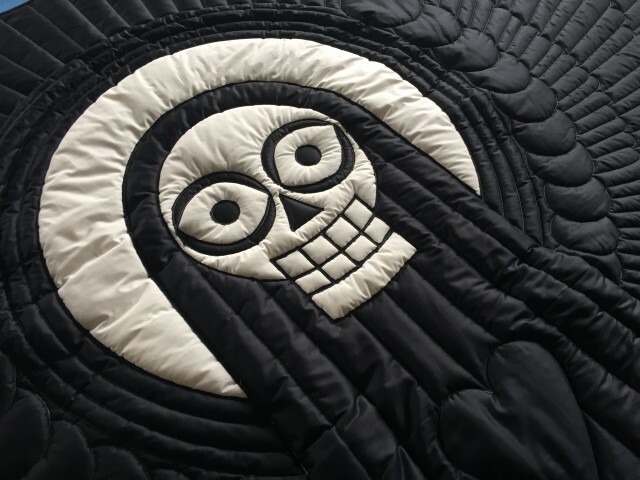 The world needs open source embroidery software. 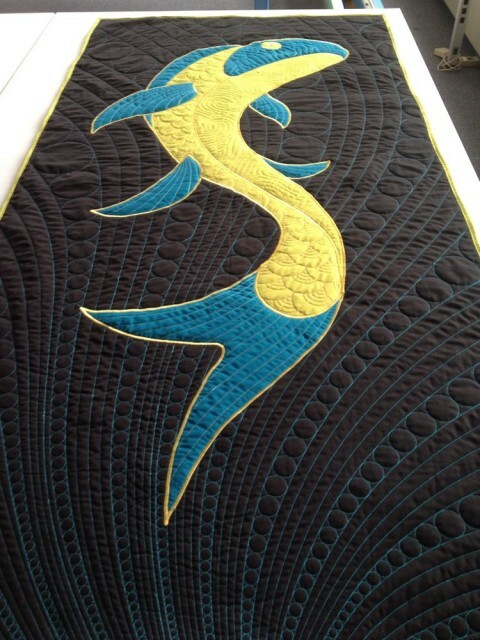 Some of EmbroiderModder 2’s kickstarter rewards include designs and stitched pieces by me. 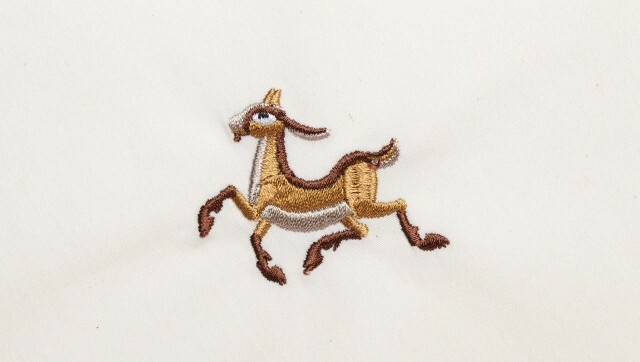 The world needs open source embroidery software. Direct Kickstarter link here. 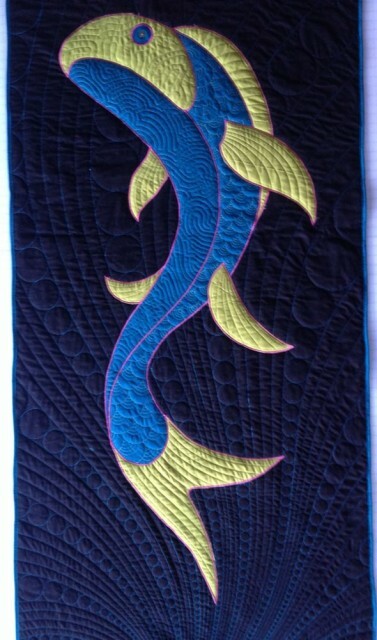 Some of EmbroiderModder 2’s kickstarter rewards include designs and stitched pieces by me. 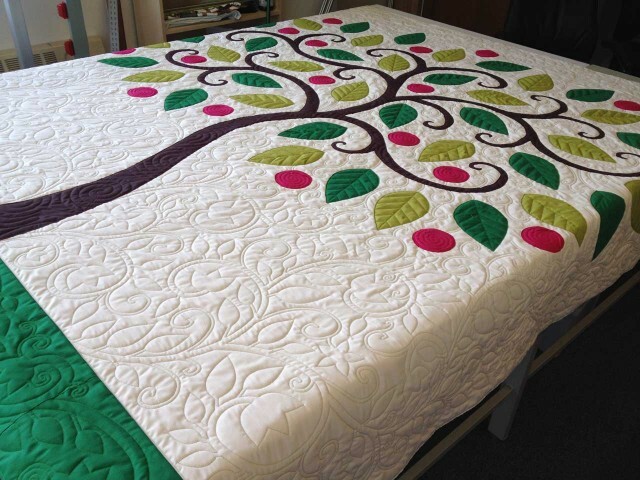 A friend recently refinished my Singer parlor cabinet (pix later) and asked to be paid in quilt. 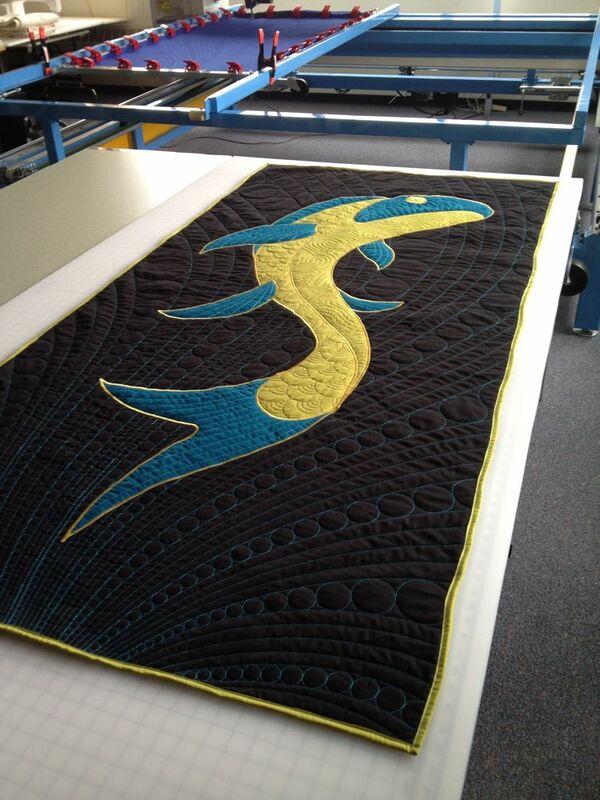 He’s a fish scientist, so naturally he wanted a fish quilt. It’s a little over 6′ by 3′ – I haven’t measured it actually. Also the photos are all a bit distorted because I couldn’t shoot it straight on. Instead these are all taken of it lying on my cutting table. The technique is Trapplique. The parts were stitched on the quilt plotter. 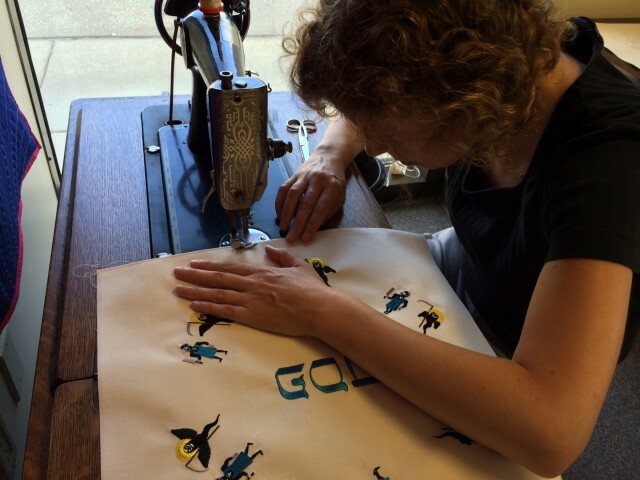 I cut them out, then basted and satin stitched them down with my sailmaking machine. 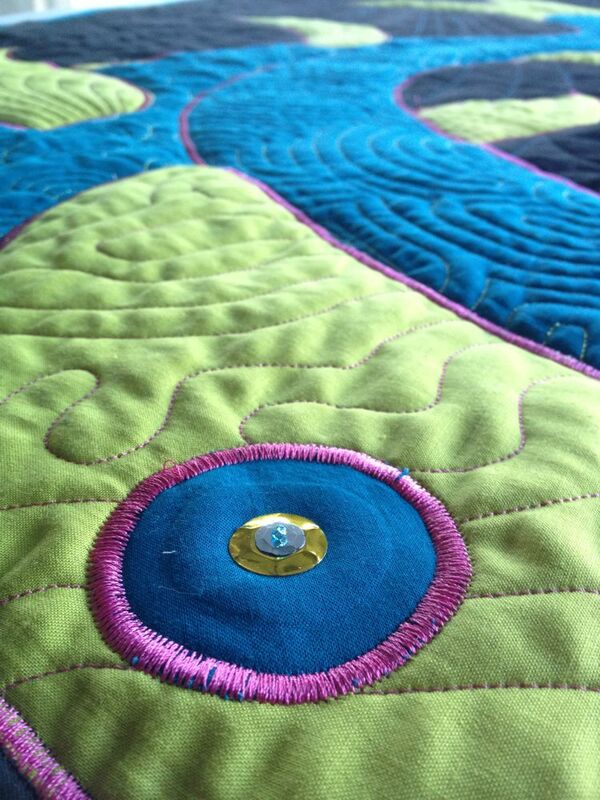 It has a sequined and beaded eye. 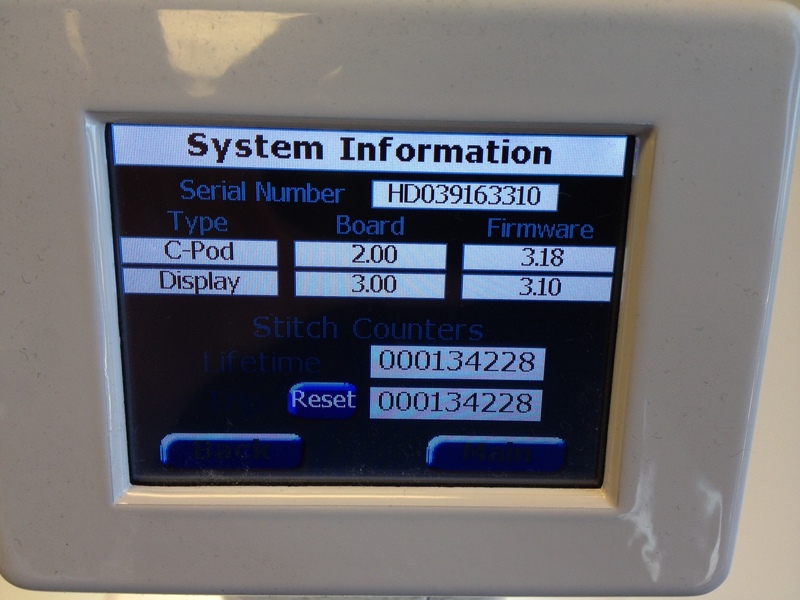 I stitched the binding on my Davis Vertical Feed, best binding machine ever. 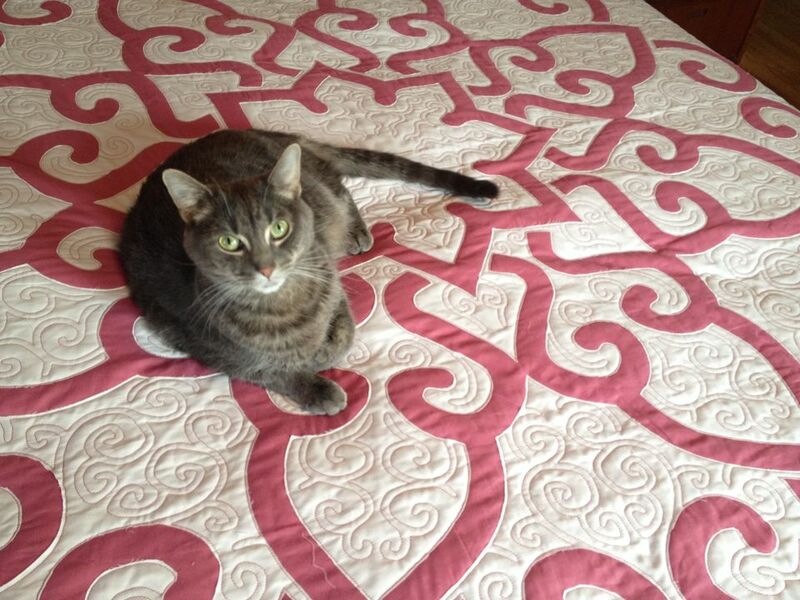 Theo machine-washed and dried our Thousand Dollar Quilt. As is always the way with money, there was a little less of it than before. The 98-inch-long quilt shrank about 5 inches (approximately 5%). 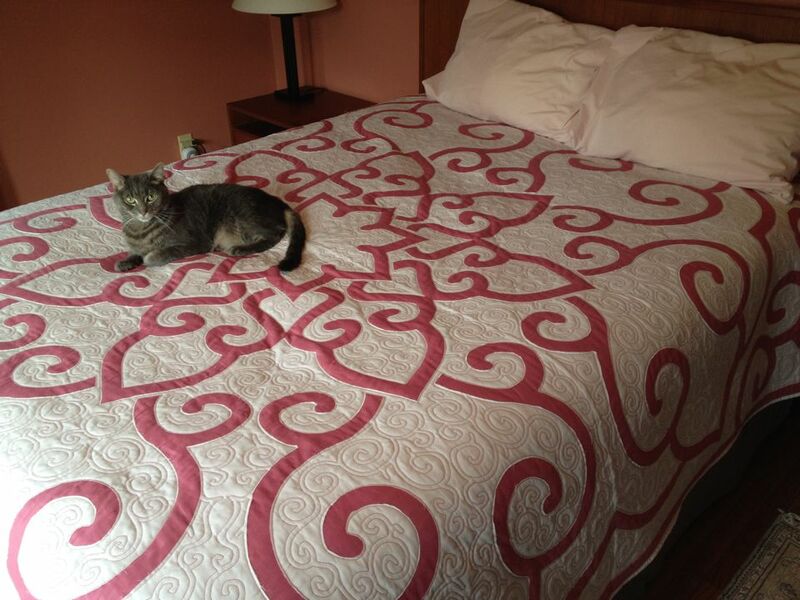 Shown above against our other $1,000 quilt test, pre-laundered, for comparison. Theo prefers the soft crinkly-ness the laundering imparts. I like them either way.